PHUKET: Phuket Governor Norraphat Plodthong this week would not confirm or deny any imminent action pending against van, taxi and tuk-tuk drivers commandeering parking spaces in Patong, despite a senior Army officer in Phuket last Friday (July 21) revealing that the drivers had until this coming Thursday (Aug 3) to clear the curbs. Gov Norraphat and all Vice Governors involved also declined to comment on an emergency meeting of the Provincial Public Transportation Committee (PPTC) held at Phuket Provincial Hall on Wednesday (July 26), starting at 8am. The silence follows the same influential committee delaying the deadline for the Patong drivers to relinquish their tightly controlled “parking spaces” – aka “taxi stands” or “ranks” – not once, but twice already: first on May 24, then again on July 3. The delays followed requests for “kindness” from the drivers, and their refusal to accept the PPTC’s decision to reduce the number of parking spaces for the drivers in Patong from 84 to just 21. They need more, say the drivers. 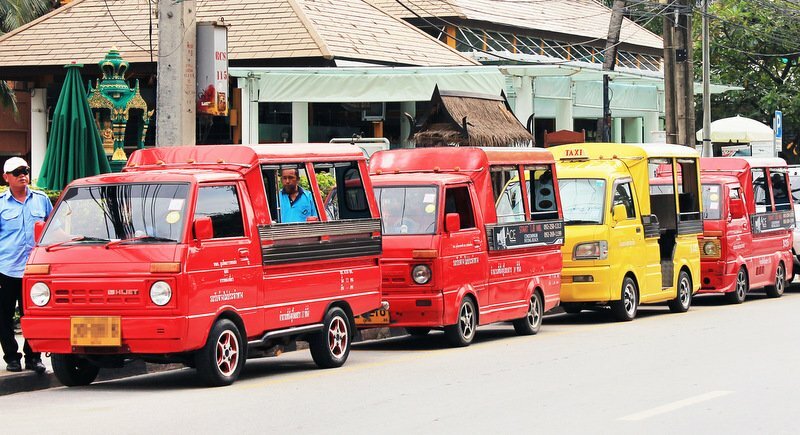 Specifically, they want 28 more, bringing the total number of taxi, tuk-tuk and van ranks in in Patong to 49. “Today was only to report about the parking points in Patong to Phuket Governor Norraphat. This report continued from previous requests from Patong van, taxi and tuk-tuk drivers on July 3,” Phuket Vice Governor Siwaporn Chuasawad told The Phuket News on Wednesday (July 26). Vice Governor Snith Sriwihok, who chairs a PPTC subcommittee specifically tasked with managing public parking, declined to reveal any proactive steps to resolve the issue. “I attended the meeting, but I didn’t stay long. I have other missions (sic) to cover,” he said. “Everything must wait for further discussion by the committee,” he added. Phuket Land Transport Office (PLTO) Chief Banyat Kantha also declined to comment. “All details are have yet to be confirmed. I don’t have right to speak about it,” was all he would say. Col Santi Sakuntanark, Commander of the 25th Infantry Regiment and the highest-ranking army officer stationed in Phuket, decided to refrain from any public position. That reminder to law-enforcement agencies direct from the Prime Minister followed the mass arrests of well over 100 taxi and tuk-tuk drivers in the anti-mafia campaign by the military and police in 2014. “Realising the problem about mafia taxi drivers disgracing the image of Phuket, I set up a team led by Gen Paween (Pongsirin) and Pol Maj Gen Weerasak Meenawanich from Region 8 to investigate and collect evidence,” said Gen Panya Mamen, who at the time was the Commander of Region 8 Police. If the army can be sent to watch a dancer gyrating her hips then surely its possible for them to watch over and secure parking for the private sector and STOP these Tuk Tuk mafia doing whatever they want on this island..
tuk tuk must be banned from phuket and replaced by mobile cheap taxis in Patong like it works in Pattaya . The army should post a few men at each of the areas tuk-tuk drivers claim as their areas. When a tuk-tuk parks there, the soldiers should tell them they have to leave and warn them that something may happen to their tuk if they stay there. They should employ the same methods that the tuk-tuks use to keep civilians from the spaces. Now, that would be interesting. Terrible news but sadly not unexpected. It seems clear the PPTC is full of corrupt cronies who are puppets of of the taxi mafia (notably including the latest attempt at a governor). These [insert cute word for cats here] need to be replaced by army officers immediately. It's clear the army are the only ones who actually care about the future of this country. Which is exactly what everyone said in the comments on the previous story. How pathetic that the taxi drivers are more powerful than the army.